Garlic mustard was first recorded in the United States about 1868, from Long Island, New York. It was likely introduced by settlers for food or medicinal purposes. Wide genetic diversity among garlic mustard in North America suggest multiple introductions. Unlike most invasive plants that are found in disturbed ground and waysides, garlic mustard has the ability to invade and spread into undisturbed plant communities. In many areas of its introduction in Eastern North America, it has become the dominant under-story species in woodland and flood plain environments, where eradication is difficult. Initial introductions frequently occur along trails where the seeds are spread by the boots of hikers. Garlic mustard exudes a chemical attractant that is also found on the native toothwort plant. The rare West Virginia White butterfly which would normally lay its eggs on the toothwort, is fooled into laying its eggs on the garlic mustard. When the caterpillars emerge, they feed on the garlic mustard leaves, which are toxic and prevent them from thriving. Between crowding out the toothwort and poisoning the caterpillars, garlic mustard has significantly reduced the numbers of West Virginia White butterflies. 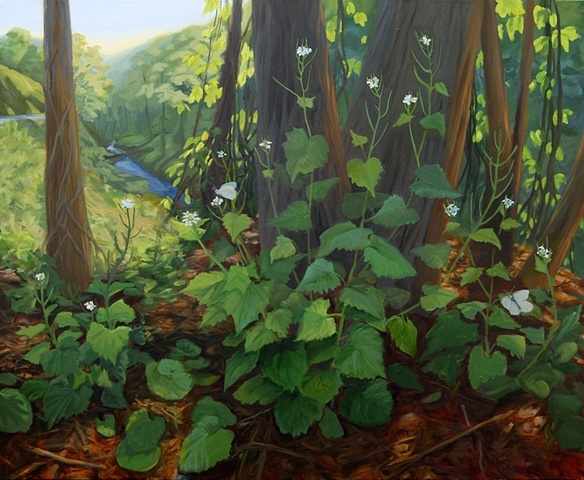 Garlic Mustard was recently shown to release phytotoxic compounds from its root system which suppress the growth of native trees by disrupting mutual associations between native canopy tree seedlings and below ground mycorrhizal fungi. While garlic mustard has historically been used as a culinary herb, Cipollini and Gruner (2007) recently found that garlic mustard also produces cyanide. They found the concentration of cyanide in the tissues of first year leaves of garlic mustard to be as high as 100 parts per million fresh weight, a level 150 times that of native Brassica species, and a level considered toxic to most vertebrates.